The page outlines the different web address options available on Oxford Mosaic, explains the technical details behind these and outlines the rules relating to each option. Domain registration and hosting is separate to web-hosting and is largely managed independently of the Mosaic platform. So in these cases, acquiring and using a custom domain for your site is a 5-step process. where <prefix> has the value that was supplied on the Site Request form. This address is suitable to be used as a public web address for your site. (Using ‘www.’ as the first part of an address is an optional convention, which is often not used nowadays.) Using the <prefix>.web.ox.ac.uk domain means the site is automatically covered by the Mosaic Platform's SSL Security Certificate which supports HTTPS by default. In this case, there is no need to register another address and you are good-to-go in putting your site live whenever you are ready to do so. However, in some cases it is desirable to have a web address that is more tailored, e.g. Approval: Please note that new domain names must be approved by the appropriate Head of Department or Head of House. Some requests may have to be referred to other bodies within the University, for example to Legal Services – see http://help.it.ox.ac.uk/network/dns/hosting/index. Steps 1 and 3 apply to all websites published on University web systems or within its domain space. 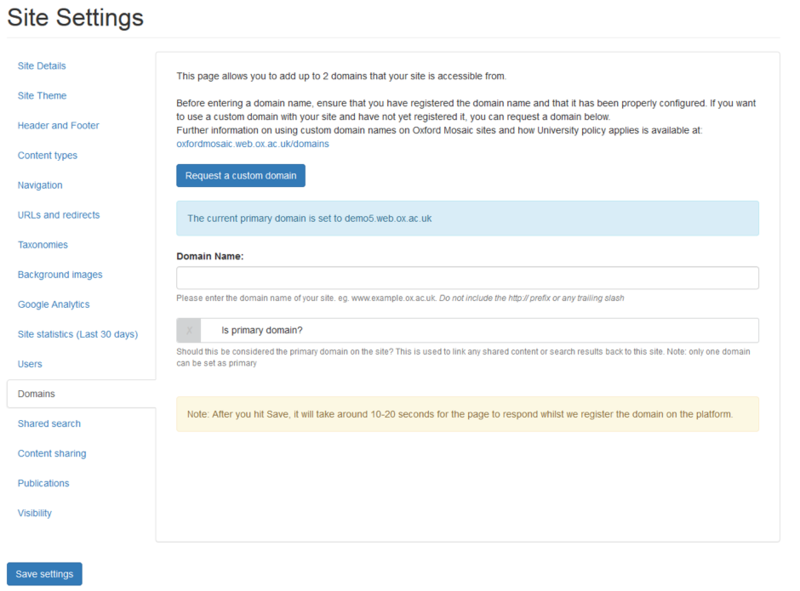 Adding the domain name to your Oxford Mosaic site (step 4) can be done at any time but will only take effect once step 3 is in place. Step 2 should be done in good time to ensure that security alerts do not appear in browsers once the new domain points to your Mosaic site. Alternatively, if you are replacing a website that already has its own domain name, this address can be added to the platform security certificate and switched to point to your Mosaic website when you are ready to go-live. Approval: Please note that new domain names must be approved by the appropriate Head of Department or Head of House. Some requests may have to be referred to other bodies within the University, for example to Legal Services – see https://help.it.ox.ac.uk/network/dns/hosting/index. Oxford Mosaic now supports HTTPS-only. This implements emerging best practice standards for website security on the Mosaic platform. As a consequence, when any custom domain is added to a Mosaic website, it must also be added to the platform’s SSL Security Certificate. If this is not done, when viewed using the custom domain, the website will display security alerts in web browsers. The Mosaic platform SSL Certificate is now updated on a monthly basis. If you plan to add a new custom domain to a Mosaic site – whether as part of a site’s go-live or at any other time - you need to inform the Mosaic service team (oxfordmosaic@it.ox.ac.uk) in good time. If you want to add your custom domain to the SSL Certificate but you are not sure whether you will be ready to use the domain by the following certificate update period, let us know anyway. We can add it to the certificate in advance, and it won’t take effect until the domain is pointed to your site. Requests to add a domain to the certificate must be received no later than when the domain has been approved by the University Domain Registrar. Please note: In order to be added to the SSL Security Certificate, the domain MUST be registered by the University Domain Registrar. To register a new domain or transfer-in an existing externally registered domain, contact domains@it.ox.ac.uk. A table of charges applying is available. Ensure that your request has been appropriately approved before making the request and explain that the site you will use the domain on will be a Mosaic website. If you are transferring-in a domain name from an external registrar, you should supply details of that registrar so that the Domains team can organise the transfer. To register a new part to an existing domain, contact the local web manager of the existing domain in the first instance. Management of unit sub-domains is often devolved to local IT managers who will be able to deal with your request, liaising with the central Domains team as needed on your behalf. Please note, six-part web addresses, such as www.<prefix>.<domain>.ox.ac.uk, are not supported by the Oxford domain name system. To comply with University policy, this has to be done centrally by the IT Services Networks team. Requests to point a domain to Mosaic should be sent to hostmaster@ox.ac.uk. Requests should be sent only after you have been given approval for the domain you wish to use to be registered: you must include evidence of such approval in your request in order for it to be actioned. "Could you add the following ASIS record via the DNS interface ASIS '<your>.<address>.ox.ac.uk. IN CNAME env-prod-01.web.ox.ac.uk.'" Replace <your>.<address>.ox.ac.uk with whatever you have registered for your domain, e.g. www.site.ox.ac.uk or site.unit.ox.ac.uk. If you are using an external URL, give that: e.g. www.site.ac.uk. Once this configuration is done, hits on your domain name will be routed to the Mosaic platform. You should therefore only request this when you are ready to go live with your site – you should allow time to complete the related go-live steps and ensure that the update of the platform's SSL Certificate has been completed. DNS updates are made on the hour: with notice, you can ask the Networks team to queue this work for a specific hour, or they will action it as soon after receiving the request as possible. Updates are sometimes actioned the next day. The final step needed to use a custom domain with your site, is to add it to your site in Mosaic. This tells Mosaic which site to resolve requests to once they arrive at the platform. This can be done at any time in relation to steps 1 and 3, but once they are completed, until this step is done, any user requesting your domain in their browser will see a Mosaic holding page. The tab displays the current primary domain of the site: until your custom domain is added this will be the Platform address. Once you add a custom domain to use on your site, you need to set your preferred domain as the Primary domain – this will be the one used in links back to the site, e.g. in the Search results list. Normally, you will want your custom domain to be the Primary domain. After you hit Save Settings, it will take around 10-20 seconds for the page to respond whilst the domain is entered onto the platform and associated to your site. Once this is finished the domain setup is complete and your site will be serving publicly to your web users from the custom domain. If you need assistance with requesting and co-ordinating the steps necessary to setup and add a custom domain for use with your Mosaic site, you may request help by selecting the ‘Request a custom domain’ button in the Site Settings > Domains tab of your site. Are you ready to take the leap and put your site live?